The WST brand luxurious bamboo towel is made from pure natural bamboo fiber. Bamboo towels are spectacular, elegant, and ultra soft. 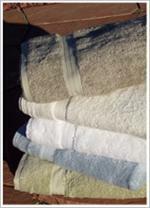 Additionally, these towels have unique properties such as the antibacterial qualities characteristic of bamboo fibers. The specifications of the Bamboo towels are a weight of 700 grams per square meter and loops comprised of 60% bamboo and 40% combed cotton. Another quality of the bamboo fiber is its high absorbency, bamboo fibers absorb substantially more moisture than cotton. This collection also offers coordinating Bamboo Robes in 4 colors.